Dark circles under the eyes are a common concern, and while concealer can do a good job of covering them up, understanding the cause is key. There are many different causes for dark circles, here we list some of the most common causes and what you can do to get rid of them. Take a look at your family; do your parents have dark circles? What about your grandparents? If they do, chances are your dark circles are there due to genetics. While sadly there is little you can do to change this, you can follow the advice listed below to help improve their appearance. The most common reason behind dark circles is lack of sleep. When we don’t get enough sleep our skin gets paler, making blood vessels more visible under the skin. Ensure you are getting enough sleep and if it becomes a problem, consider changing your lifestyle. Dehydration affects skin in a number of ways and it can make dark circles appear more visible. Monitor your water intake and ensure you are getting at least eight glasses a day. Being overly stressed can really show in your skin, leading to outbreaks and, yep – you guessed it, dark circles. Try to dedicate some time every day to relaxing, whether you do this by meditating, reading or just enjoying a long bath. In some cases, dark circles can be a sign of anemia – meaning that you don’t get enough iron. If you suspect this as a reason, do consult your doctor. You can increase your iron intake by eating iron-rich foods like leafy green veg. Always remove your make-up before you go to bed. Leaving it on will clog your pores and can make puffy eyes and dark circles more prominent. Use chilled tea bags on your eyes in the morning. You could also try cold teaspoons or cucumber slices to help reduce puffiness and boost circulation. Apply sweet almond oil as an overnight treatment under your eyes – this will moisturise and help lighten the skin. 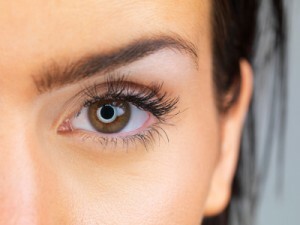 If you feel you need a little extra help, speak to a beautician about eye treatments. Find a beautician near you using our advanced search tool.